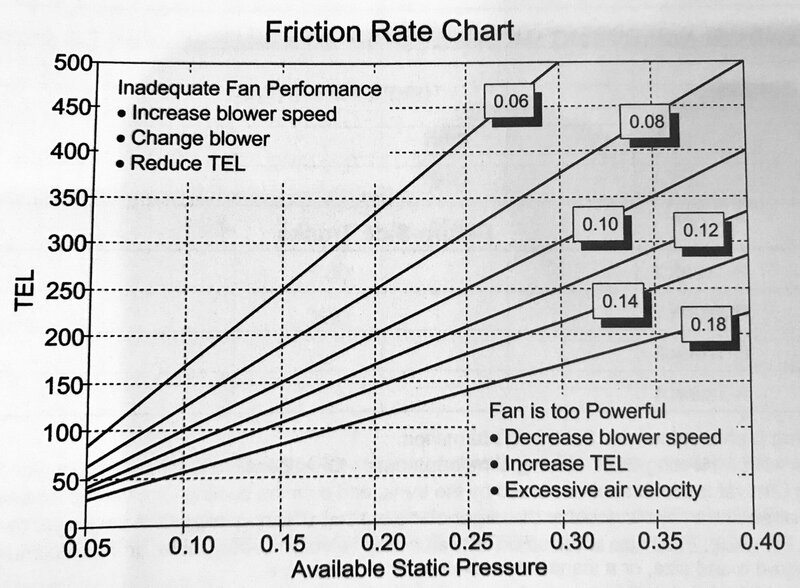 A lot of proper duct design comes down to a understanding of available static pressure and friction rate. We’ve covered this topic several times on this site and on the podcast but I wanted to focus on this ACCA chart specifically (shown above). There is only one way to know your ASP and that is to calculate how much ADDITIONAL static pressure your blower can work against and still provide the correct airflow once the everything in the airstream is accounted for OTHER than the ductwork. This can include coils, filters, dampers, grilles and heat strips with the static pressure drop calculated in inches of water column at the design airflow. This ASP # you come up with can often be adjusted later by choosing a different speed tap on traditional PSC systems or by sacrificing efficiency in modern ECM / X13 blowers but to start with we will generally use the 0.50 TESP target as our goal to start with at rated airflow. The vertical axis along the left side displays the total equivalent length of duct in the critical duct path. This is the highest friction path all the way from the return through the supply and includes the straight duct runs as well as the equivalent lengths from duct fittings and transitions. The TEL will always be longer and generally significantly longer than the actual lineal length from the longest return to the longest supply. Once the TEL and ASP are calculated you simply use the chart to intersect the two to calculate the design friction rate for the duct design. For example if we calculated a 300′ equivalent length with an available static pressure of 0.2″wc (which is a very typical situation) that could be interpolated to a design friction rate of 0.07 for the design. From a practical standpoint you need to stay within the wedge to have a duct system that will be realistically sized. If you end up above the chart wedge at 0.06 then you need to either find a way to reduce your equivalent length by reducing fittings, moving the furnace to a more central location, using a less restrictive filter etc…. or you need to find some more ASP headroom by choosing a higher blower speed or a more powerful blower that can work against more static pressure. This next part is MY opinion but it’s backed up by common sense and ACCA Manual D A15-5 (look it up). If you end up under the wedge you could POTENTIALLY end up with too much airflow but with modern X13 / ECM motors that’s pretty unlikely because they will ramp down to maintain constant torque / airflow. Because of this (In most cases nowadays) being under the wedge isn’t a real problem and 0.18 could still be used as the design friction rate. Now keep in mind…. this chart is from ACCA Manual D and only designed for residential. Commercial is a different process.